Your Family Tree Never Looked So Good! This is a beautiful family, and we’re sure yours is just as beautiful to you, too, which is why we’re going to pass on some insider’s tips from the artist who brought this tree to life. 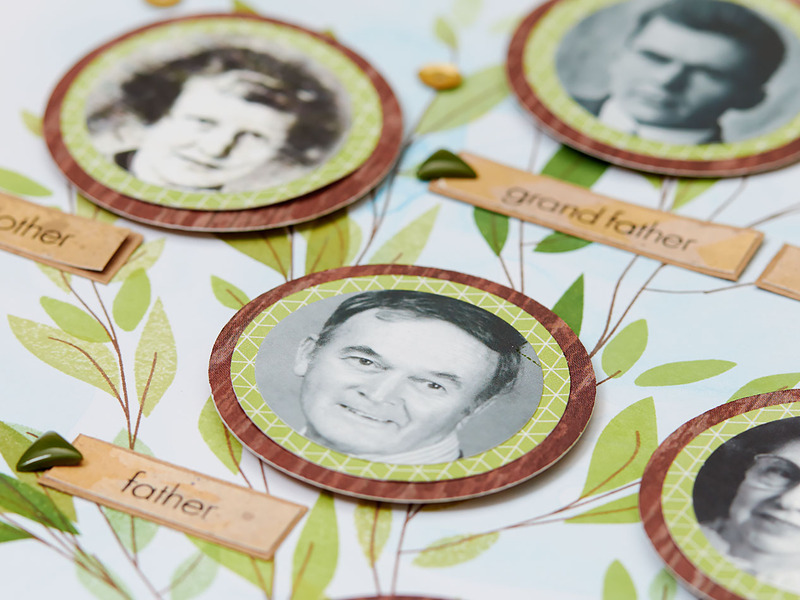 Sharing a page like this one with your children and grandchildren is sure to give them a greater appreciation for their heritage and the art of preserving family history. Let’s take a closer look, then, shall we? First off, our artist made good use of our watercolors to create a breezy blue background. She then used the My Acrylix® Friend Tree stamp set to stamp the limbs of the tree. Because the stamps are flexible, she was able to bend the stamp to shape it just the way she wanted before inking and stamping it in place. This allowed her to plan out where she’d be placing her pictures and which spaces would need the most leaves. The leaves were stamped using stamps from the same set and a variety of colors, including Pear, Fern, Topiary, and Sweet Leaf (how fitting!). When it comes to adding the leaves, our artist recommends starting with a lighter color and working with one color at a time to fill up your branches. Notice the textured look on some of the leaves? 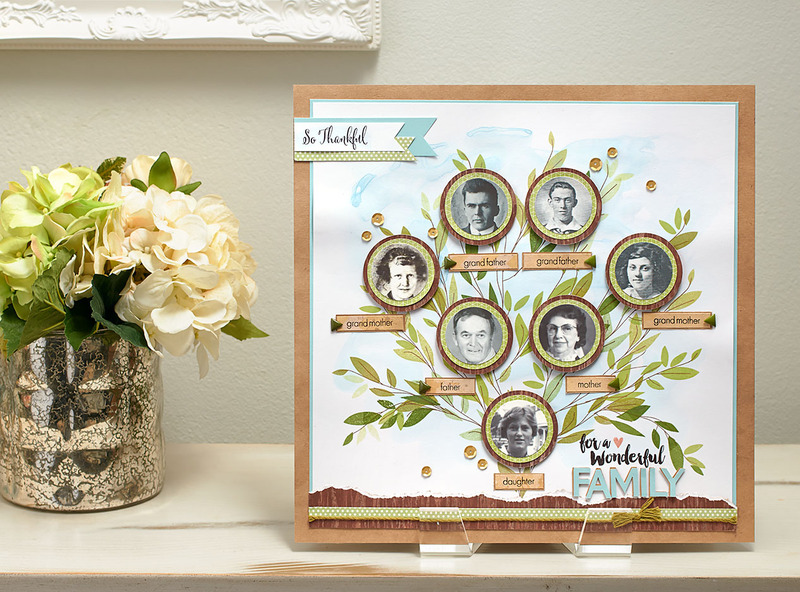 To create this effect, our artist stamped on a piece of scrap paper and then the page itself, making each branch and leaf on the page unique—just like every person in her family tree! The tasteful accessories our artist chose also add some class to this page. 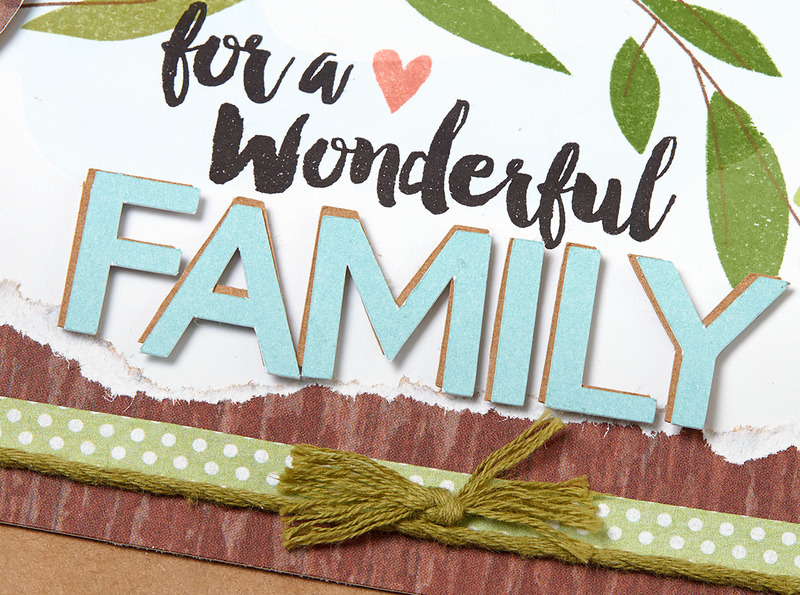 The page is anchored down by a torn paper strip from the Urban paper packet, the popped-out “family” title, and a twine bow that contributes to the natural feel. A dovetailed title, a handful of gold sequins, and elegant enamel triangles finish the ensemble nicely. So, are you ready to memorialize your own family? No one knows them better than you do, and now you have a new idea for creating a visual reminder of their lives and of the relationships that tie you all together. Enjoy the family reunion! This is beautiful! I will be making this special page. Thank you! This is stunning! I would love to do something like this for my family history! Wow! What an amazing and sweet layout! I love this!! Thank you for giving us great ideas. 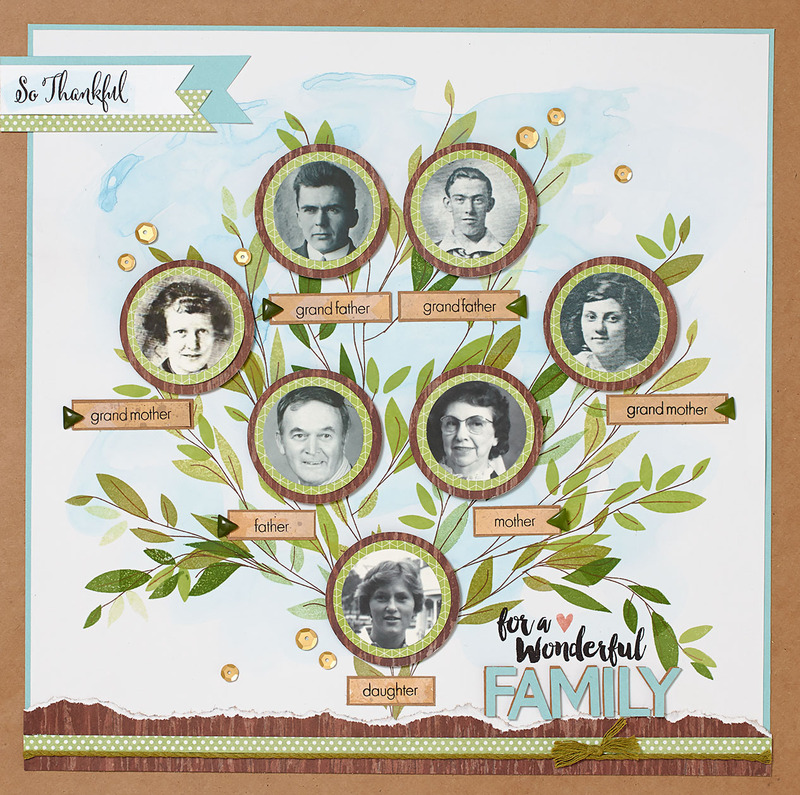 This is amazing, I can’t wait to do some of these family tree’s. Beautiful piece of artwork and so meaningful. Thanks for sharing it with us! What a nice gift in my inbox! This post is truly a gift from CTMH artists! Thank you for the endearing inspiration!